This post was brought to you in part by the Shiba Prom Haiku Contest, which Tierce won. Tierce: I am never going along with any of your crackpot schemes again! Me: Don’t knock yourself. You’re a very talented poet. It was also brought to you in part by Filthy Farmdog soap. Tierce was less than impressed by the whole contest winning experience. However, I was thrilled. And, because I’m an evil dog owner who wants Tierce to suffer, I was ecstatic to make use of the Filthy Farmdog soap for the first time. Bad owner! No biscuit for you! I snapped, I’m sorry. I know that I’ve had a page all about Shibas and it’s helped a lot of people and that some people consider me the living end of Shiba knowledge (I’m not! Try Shiba Inu Canada or the National Shiba Club of America). But I’ve proven myself to be a bad, evil dog owner and not deserving of the title Queen of Shiba. I took Tierce to the groomer’s to get his nails clipped. Now I know that I should be stoic in the face of his whining, moaning, bitching and complaining, his earsplitting wails, and his sulky pulling away, but I’m not. I’m terrified of hurting him and he’s terrified of me hurting him. It’s safe to say that we both hate the procedure. One day, a few days ago, I looked at his paws and they resembled a bear’s, with nails out to —– here and knew that I was just prolonging the inevitable. Dog ‘N Suds is a grooming/care facility not very far from where I live, so I slouched there to deliver my little brat. Tierce, of course, was extremely excited and interested, even in the trio of Dachshunds threatening to rip out his throat on his way in. He behaved himself, at least, even when it was his turn. The groomer whipped him under her arm and carried him into the back with the ease of long practice. Two or three minutes later of whining, moaning, bitching and complaining, he was out, congratulating himself on his miraculous escape from death. It was the best 10 bucks I’ve ever spent. No, seriously. Best. Ten. Dollars. Ever. Even if it makes me a bad puppy owner who can’t stand to clip my dog’s nails, if there are competent people who will do it for a price. If there wasn’t anybody, I could steel myself to do nails, but I’ve tasted the lack of stress and it is sweet! Now I know why Mom pays for Shassi to get groomed – it’s just EASIER. Today, I brushed Tierce. This is the result of 30-45 minutes of constant brushing with the slicker and the FURminator. I generally have a low opinion of the latest overpriced, overhyped miracle tool, but this thing really works! It has a row of tiny, sharp inverted Vs that catch the dead hair and pull it out of the coat. It’s real charm is the fact that one does not have to stop to remove the hair from the teeth in order for it to keep working. The FURminator, alas, is not without its drawbacks. For the price (roughly $50 Cdn and up), this thing ought to groom your Shiba itself and clip its nails into the bargain. Instead of containing the fur in a easy-to-grab area, like the average slicker brush, it pulls it out in large, amorphous clouds, which float away and glom onto the nearest clean surface. I like the slicker for its ability to pick up the loose hair that the FURminator leaves behind and to generally separate and pull dead hair out of the coat. 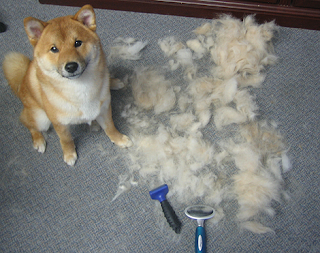 The next time you and your Shiba are in a pet supply store, see if they have a test FURminator that you can try out. You may be impressed at the amount of fur it removes.